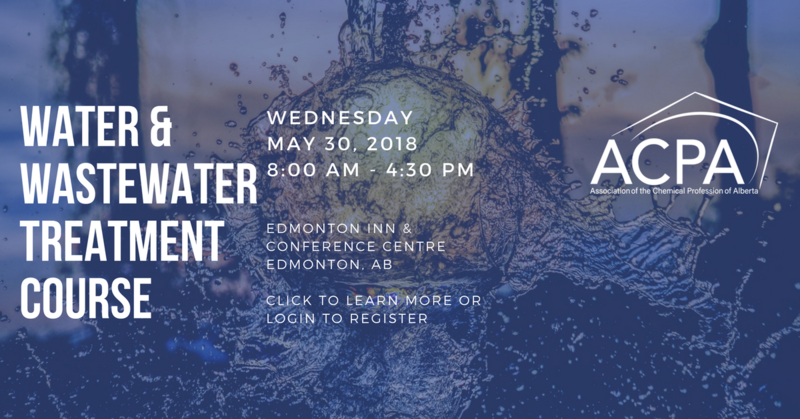 The Association of the Chemical Profession of Alberta is pleased to offer a one-day course on water & wastewater treatment. Basic application of water, water quality, water chemistry and laboratory measurement methods are discussed. Further water and wastewater treatment terms and methods such as sedimentation, coagulation, filtration and ion exchange will be reviewed. Specifically, water and wastewater issues for the oil and gas industry will be addressed. Some examples are flow back water and produced water. This one-day course provides an overview and basic understanding of water and wastewater treatment. If you are working in water and wastewater related industry as a chemist, technologist, manager, engineer or simply are interested in the subject matter this course is recommended for you. Please note that there is no prerequisite required. Course materials will be provided. Sponsorship opportunities available, download information sheet below for more information. To register online, log in to your account at the top right-hand corner of this web page, hover over Member Menu and click on Event Registration and follow the instructions from there. If you are not an ACPA member, you can create an account and use it to register online as per the instructions above. If you have questions, call the ACPA office at 1 (780) 413-0004.